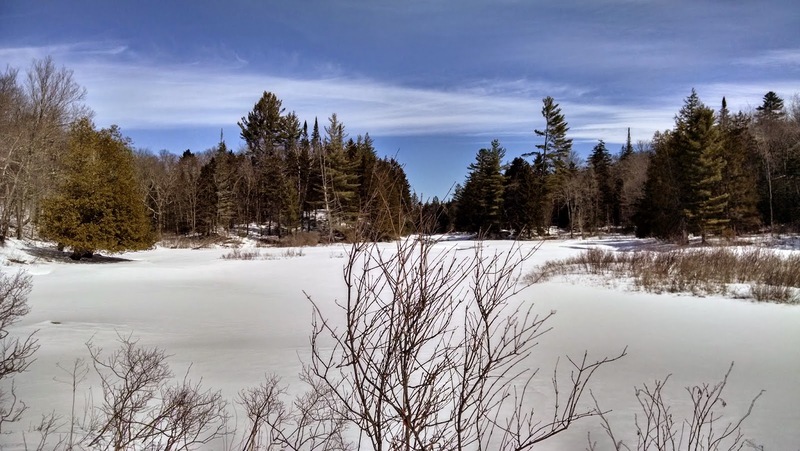 Back on 2/21/15, Leesa and I did an XC ski trip in the Essex Chain Lakes Tract where we did a loop ski of Fifth Lake through Eighth Lake. 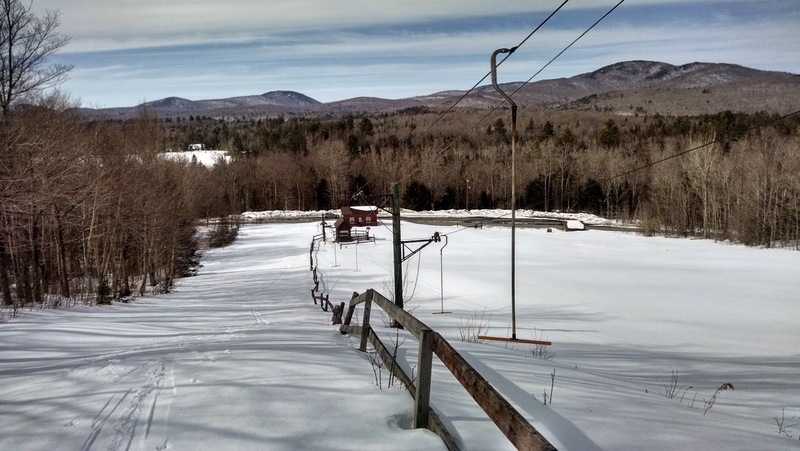 At that time, we did not know about the new Upper Hudson Ski Loop, which starts practically in sight distance from where we started on 2/21. After learning about the new loop I added it to my list of places to visit. Today turned out to be the day. 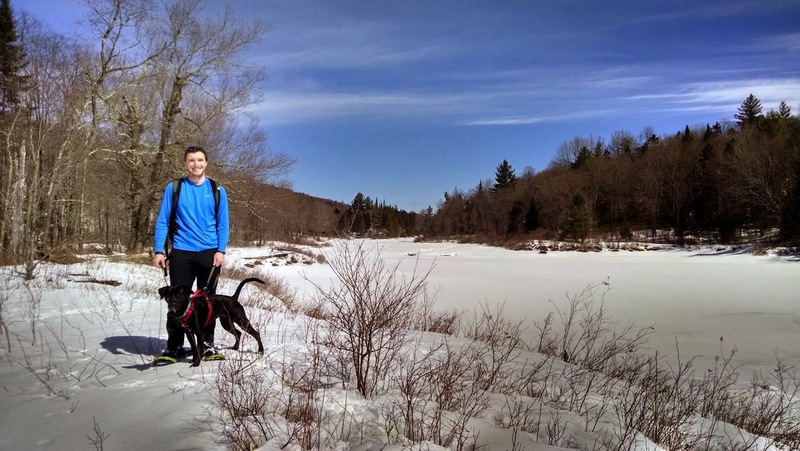 My son Zack had the day off from work, so he and his dog Lulu joined me. Zack was on snowshoes and I chose to ski. Zack recently got Lulu and this was going to be her maiden hike. 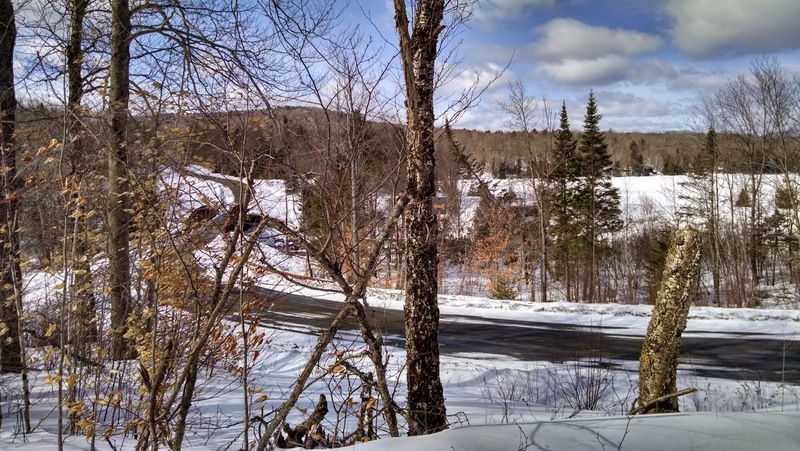 View of Chain Lakes Road from the start of the trail. 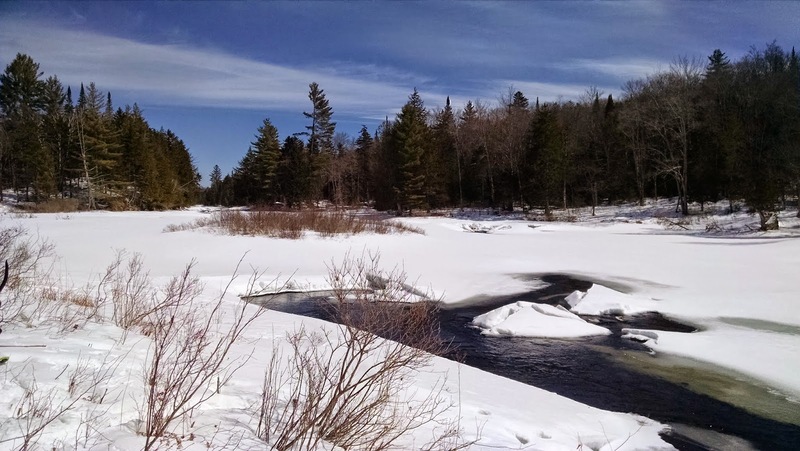 The Goodnow Lake outlet is under the truss bridge. We started from the designated parking area at around 10:15. It was 28 degrees and warming up, so I put some glide wax on my skis. The trail follows an old logging road a begins in a young hardwood forest. At 0.65 miles, we reached the junction for the loop portion of the trip. DEC has placed an arrow pointing right, and that is the way we went (although you can ski either direction). The counter-clockwise direction is a little easier for the skier. At 0.85 miles we passed a small vly. At 1.25 miles we came to the biggest hill on the counter-closckwise loop and it was not difficult. I went first so I wouldn't run over Lulu with my skis. 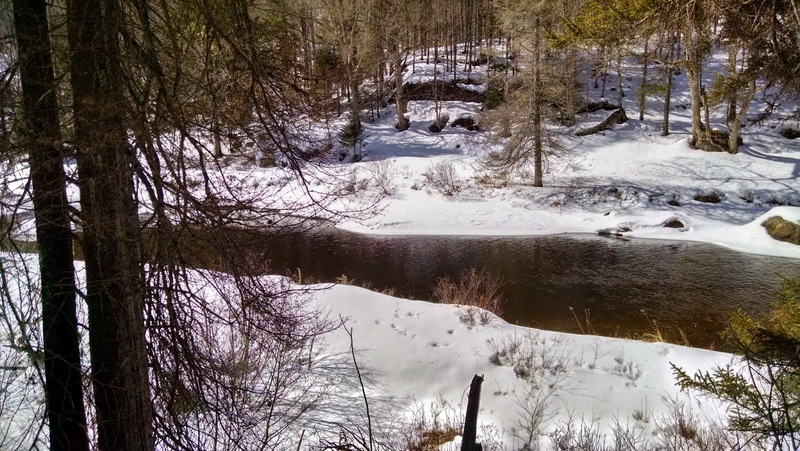 At the bottom of the small hill, we entered some pines and soon found ourselves alongside the Goodnow River. We took a short detour off the trail to get a better look at the river. 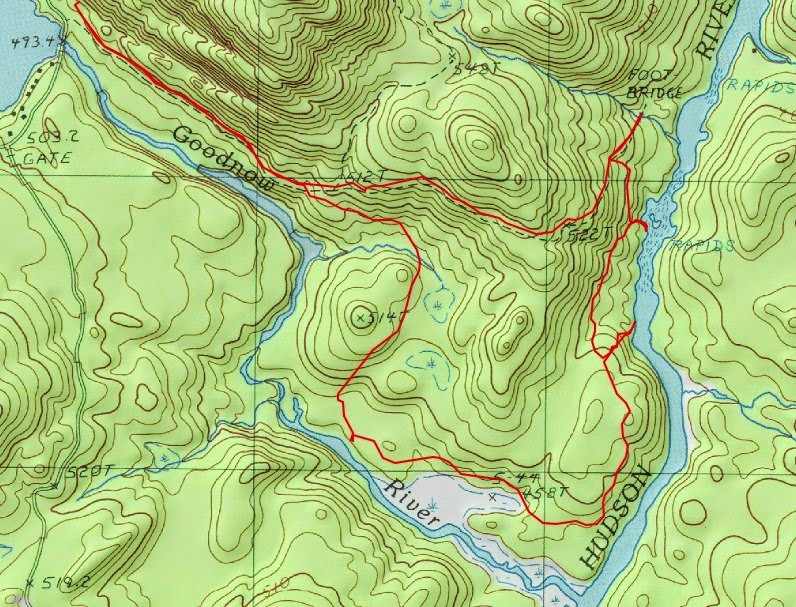 At 2.0 miles, we were near the confluence of the Goodnow River with the Hudson River. The trail turns north at this point so you won't see the confluence unless you leave the trail to look for it. The forest returned to hardwoods and stayed that way for the balance of the trip. At 2.4 miles, we could see the Hudson River on our right. I wanted to get a look so we left the trail to go the short distance to the water's edge. We had gotten quite warm by this point, but there was a nice breeze flowing down by the river and it felt nice. (Spring must be coming if a breeze feel nice!). Some spots on the Hudson River appeared frozen and some spots were open water. We did not venture out onto the ice. There was probably some solid ice, but I suspected some areas would just be snow cornices that would not support our weight. There was no need to test it out. After the Hudson River we returned to the trail and followed it as it climbed away from the water. 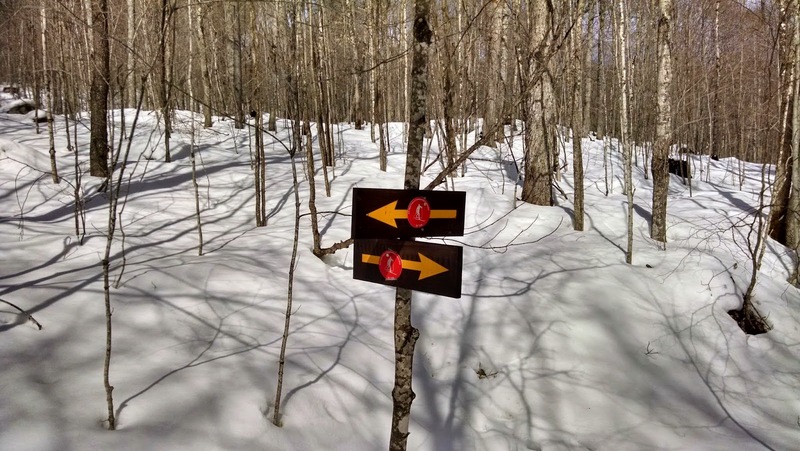 At 3.3 miles, the trail intersects with another logging road the the marked trail goes left. If you go right, the logging road descends 0.1 miles to a small bridge over a creek. We went to this point, but then turned around and returned to the trail which continued to climb and began to turn in an easterly direction to close the loop. Prior to closing the loop we reached the height of land along the trail and then began a gentle descent which returned us to the head of the loop. It was now 35 degrees as we finished off the last 0.65 miles back to the car. The snow had been a little sticky and it made the uphill sections easy to climb and I managed to kick the snow off to glide relatively well on the downhill sections. 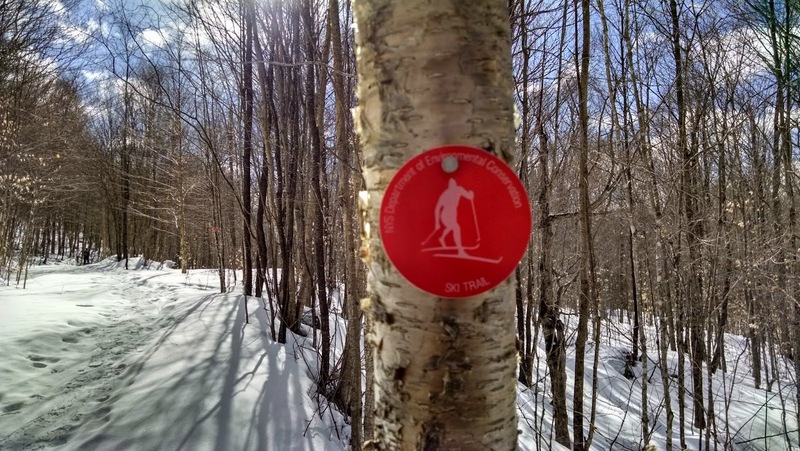 This trail can be done by someone that is a high beginner or low intermediate level skier. There is nothing too difficult under good snow conditions. Best of all for us, Lulu did great on her first hike! 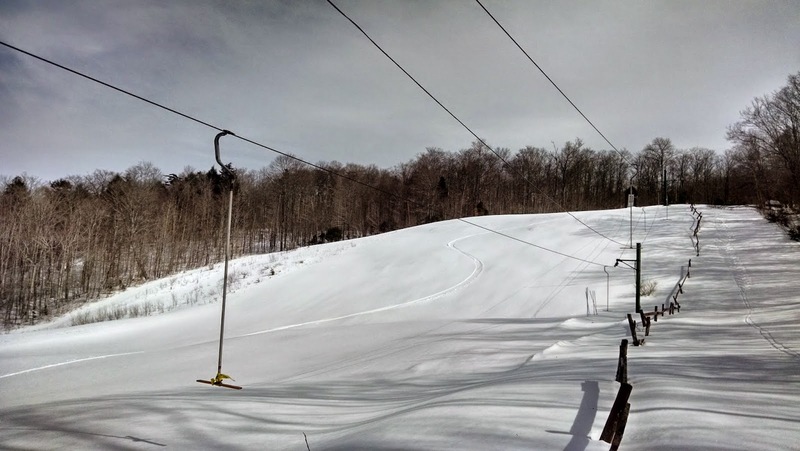 After having lunch with Zack and his fiancee' Hannah, I went back to Newcomb to ski a few runs on the Newcomb town ski hill. It was untracked with fresh powder on top and I couldn't resist taking 3 runs down. 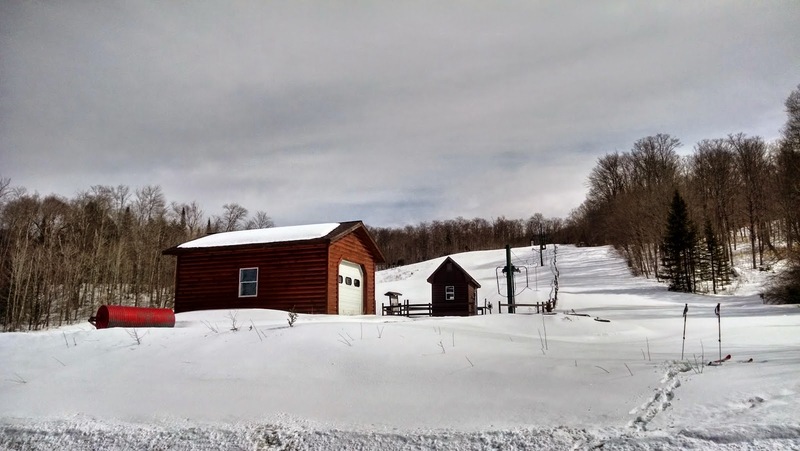 The hill is just 0.5 miles south of Route 28N. The T bar was not running but I was able to easily herringbone up the hill. 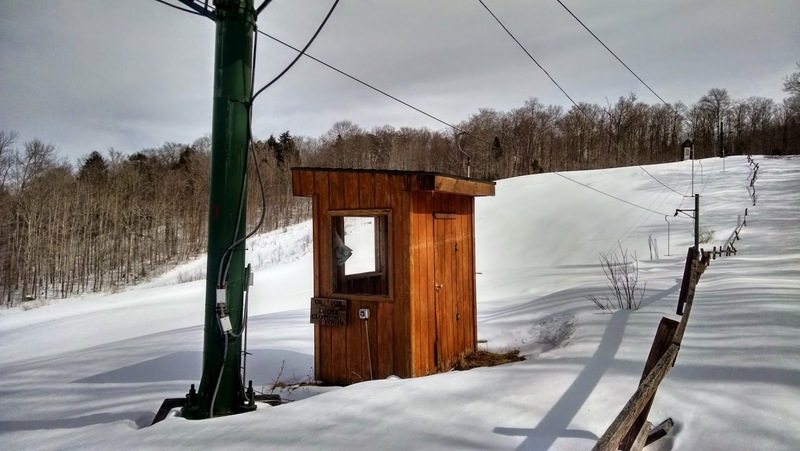 I also skied up the access road behind the top of the ski hill to the top of the hill behind. From there I skied back down to the ski hill and out. In all my infinite wisdom, I thought Averill Peak would be a peak I could summit even with a deep snowpack, since a communications tower access road leads to within about a quarter mile of the summit. Wrong once again. 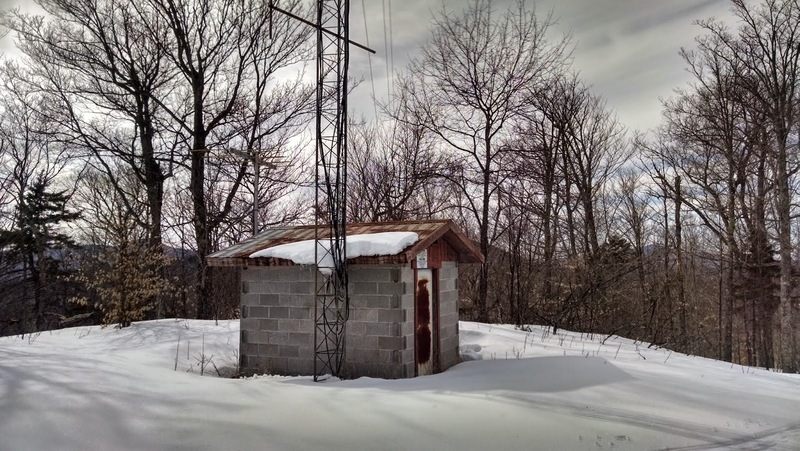 After spending a lovely morning XC skiing at the New Land Trust, Leesa and I headed over to the hamlet of Lyon Mountain to do an afternoon climb of Averill Peak via the access road. First we parked at the wrong spot, adding about a half mile walk each way to our trip, no big deal. We had parked at the end of School Hill Street, when we could have driven up Power House Road to the beginning of the access road. From where we parked, we got to walk past the huge abandoned Power House building. After a short walk, we gained the Power House Road and followed it up to the power building a water storage facility. Here we saw 3 cars parked and talked with a man there who said that others were up on the access road skiing. We began climbing and I was immediately saddened that I had not thought to bring my skis and climbing skins for this trip. 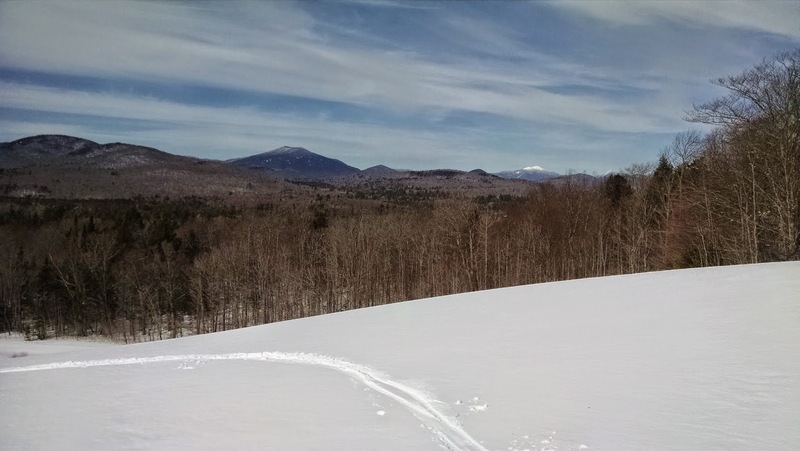 While occasional snowmobiles use this access road (we saw two), it is great for spring skiing or powder skiing. We were following the ski tracks of several persons who had skinned up ahead of us. From where we had parked we climbed a mere 800' in the first 1.75 miles. The elevation at the start was 1900' and there was lots of snow even at the base. At 2700' there was a distinct change in grade and we climbed 1000' in the next 0.9 miles to the tower on the sub-summit at 3703'. While we were climbing I could tell that there was close to 2' of snow on the ground in the woods. Still, I expected I could trudge through a couple feet of powder for 0.25 miles to get from the sub-summit to the true summit. Perhaps it would even be broken out by previous snowshoers. I started scouting around at the tower looking for a track or a seam in the trees heading SE, I had no such luck. The spruces were tight and full of snow. While still within sight of the tower, Leesa fell in a spruce trap to her waist. I helped get her out. That was enough for her to decide she was done. I still hoped I could find a way through the trees, but the minefield of spruce traps was too great a risk to take. If I were alone, and fell in a spruce trap and got stuck, it would not be a good scene. It's one thing to fight deep powder, but it's another to not know whether the floor will fall out below you. Decision made... I would turn back. I don't mind having to hike this mountain again. The only snag is the long drive to get here for me. 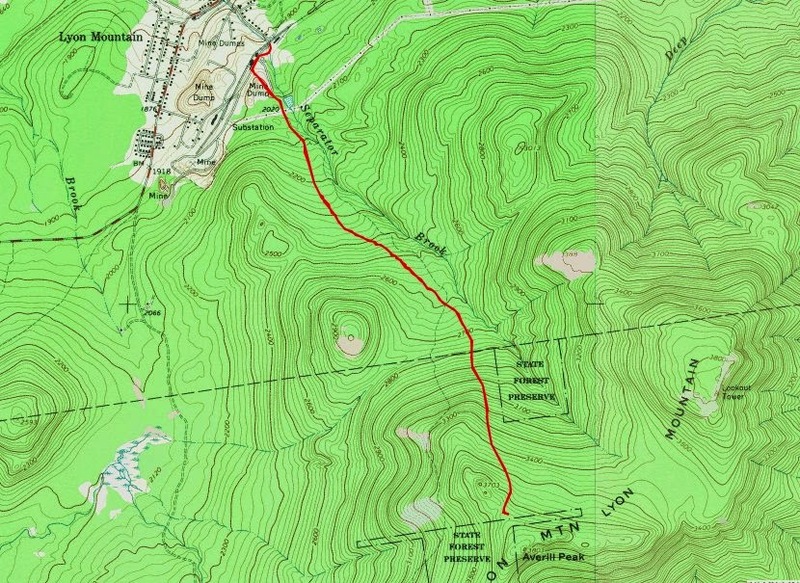 I'll return in a different season for the hike, and maybe, I'll return in the winter to ski this route. This was certainly a beautiful weather day and we had great views from the sub-summit. It would have been a fun run down on the skis with these spring conditions. We saw 2 guys skiing down and they were having a blast. Leesa and I pulled the cross country skis out for another late season ski outing today. 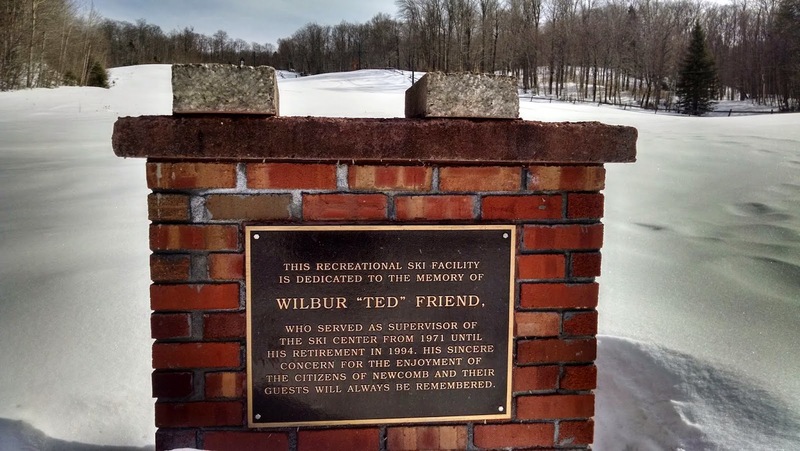 I had recently read about a place called New Land Trust that I had never heard of before. It sounded promising, so we headed north this morning to take a look. This is a wonderful place. Be sure to add it to your list of places to visit! Also on the agenda today was a climb of Averill Peak, but we chose to ski first before it got too warm. 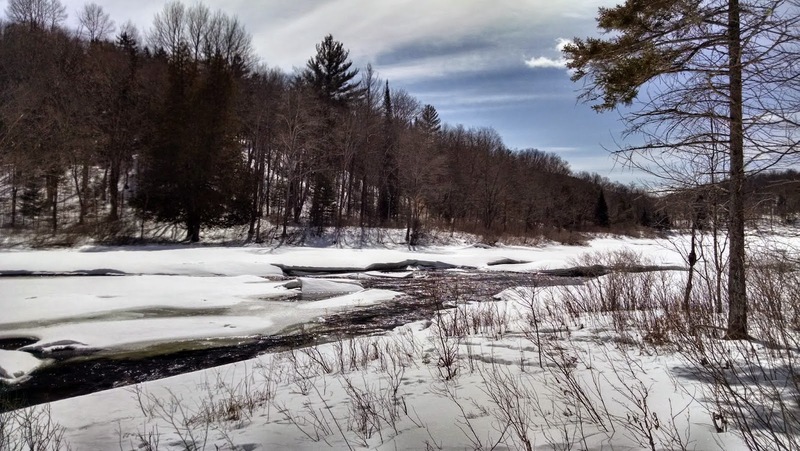 The New Land Trust is located on Plumadore Road in the Town of Saranac, Clinton County. 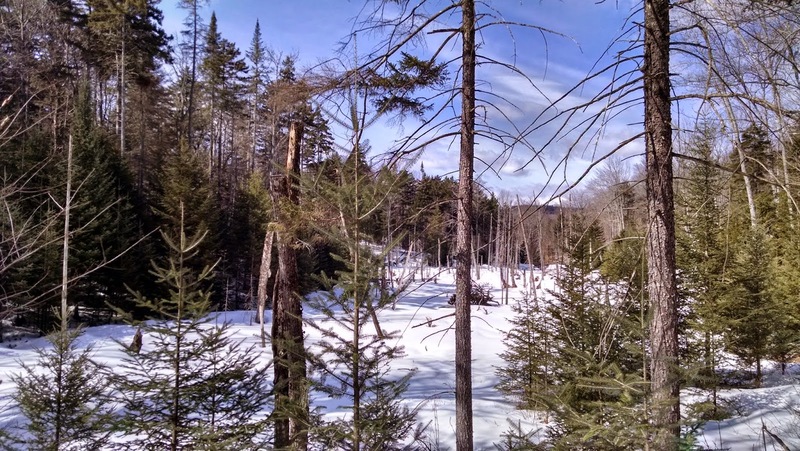 The area is a couple miles south of Chazy Lake and lies in the shadow of Lyon Mountain which is 2 miles NW. 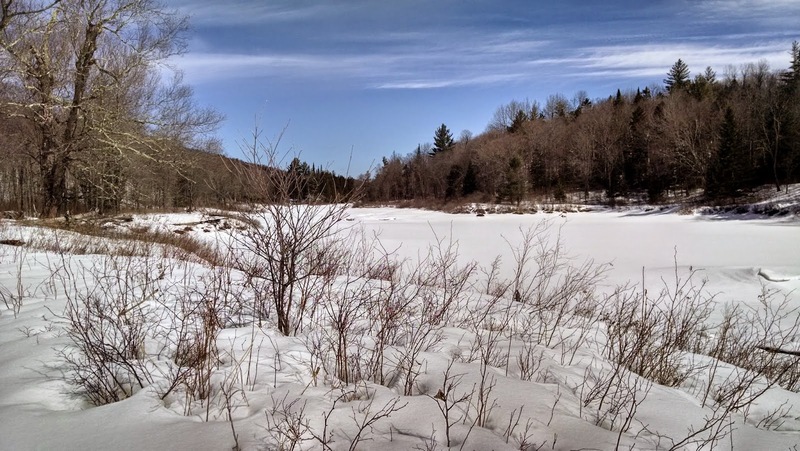 As we drove north, the snow on the ground disappeared and even within a couple miles of the New Land Trust, there was no snow on the ground. Fortunately, as the road began to climb towards our destination, the snow reappeared. We pulled into the parking lot and found ourselves surrounded by nice snow cover. There were 2 other cars in the parking lot, but we never saw anyone all day. The New Land Trust (NLT) is a 501(c)3 non-profit that exists for the community and is supported by private donations. 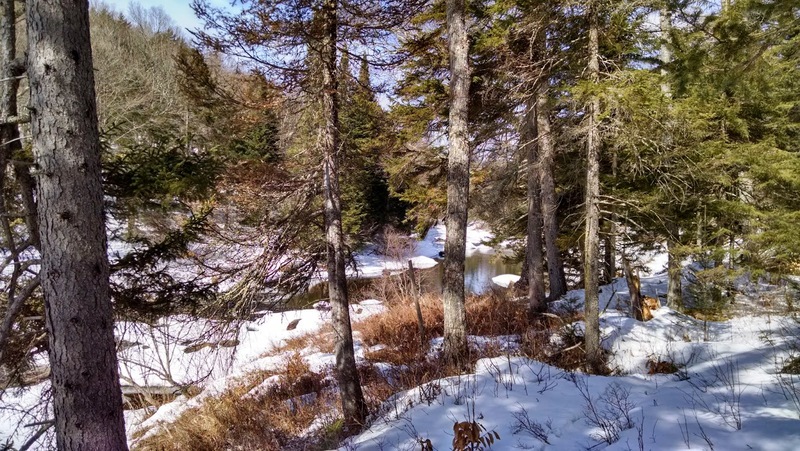 The land parcel is 287 acres and 31 trails wind through the property. 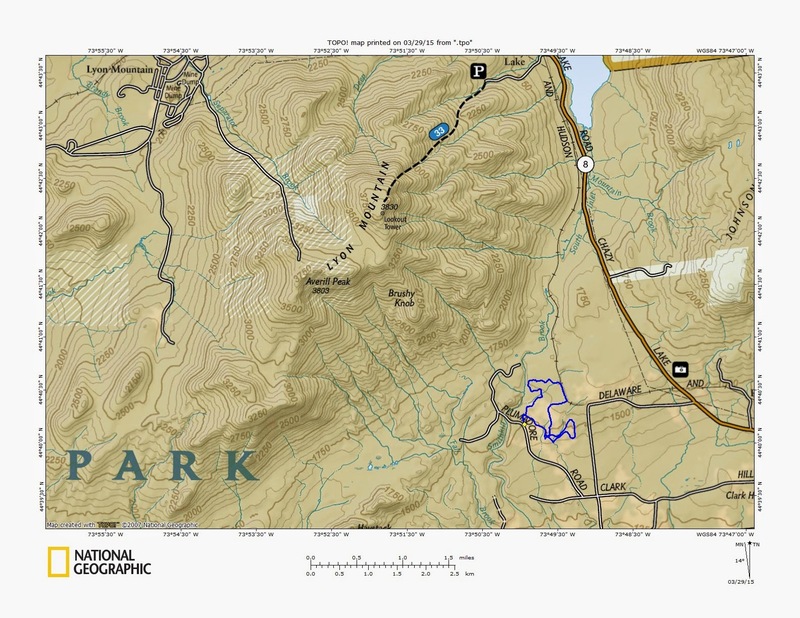 Information and a nice trail map can be found on their website at newlandtrust.org. 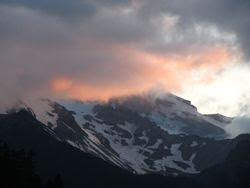 Last night the temperature had dropped to -9 degrees, but it had warmed nicely to 30 degrees by the time we arrived. I had glide wax in case the skis started to stick to the snow, but we had no problems. The snow conditions were wonderful. 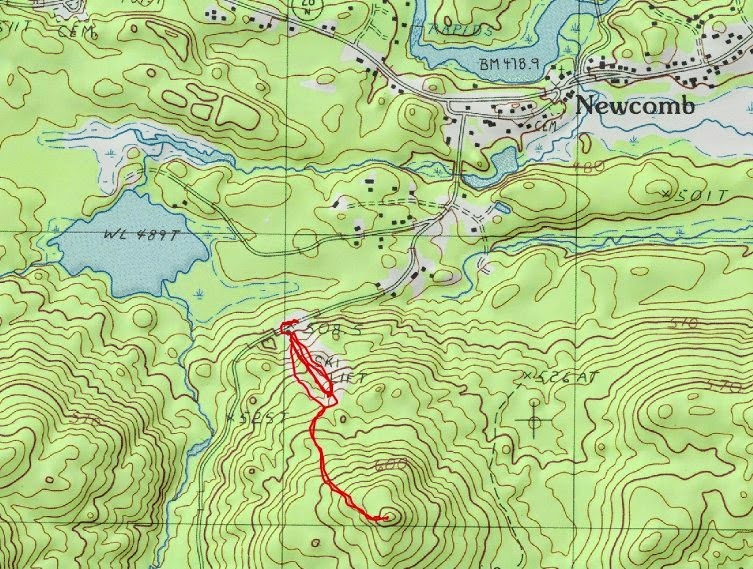 We studied the map at the kiosk and decided to take the 3 mile red trail which is an easy intermediate loop. We went clockwise. Immediately we arrived at the "236 Clubhouse" and signed in at the register. I'm not sure what the 236 Cluhouse is currently used for and I didn't find any information about it on the website. I don't know if it has any public function or not. There is also a "Bunkhouse" and "Luke's Lodge". After the Bunkhouse, we started out on the red trail. 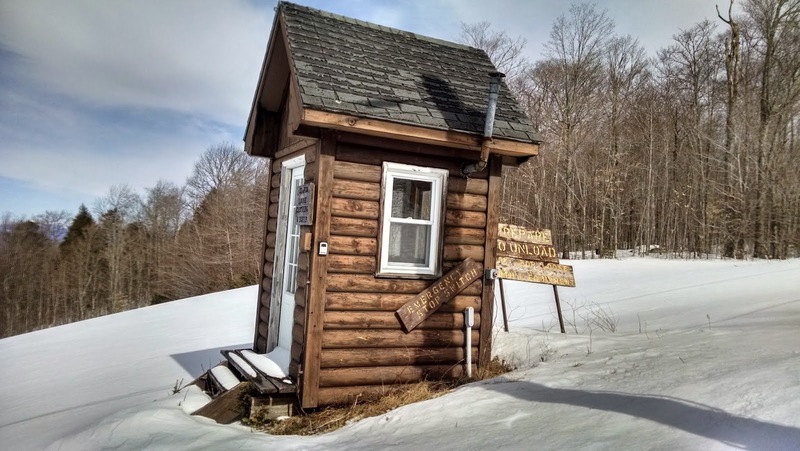 We passed a second kiosk that had a nice sign "Dog Doo Makes Bad Ski Wax, Pick It Up". We had our dog Rev with us, but she didn't choose to leave any "doo", so we didn't have any cleanup to do. 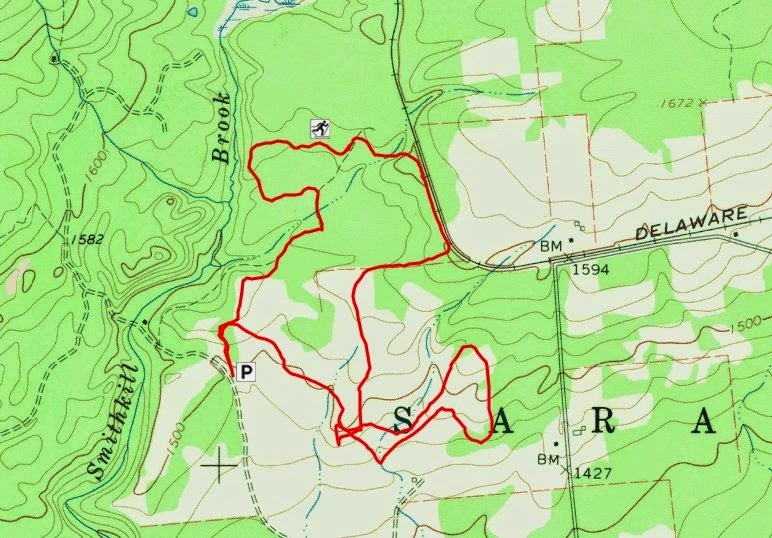 Below is a map of the red trail which we chose to follow. As we headed north to start the loop, the trail entered a pine forest. The snow here was a little crusty and there were some pine needles and twigs in the trail, but really not bad for 2 days before April 1st. The back of the "236 Clubhouse"
After looping through the pines at the north end of the property, we came into a young forest of hardwoods. This was obviously an old farm and stone walls zig-zagged through the area. Soon we found ourselves at "Top Dead Center". Perhaps the enter of the parcel? We had nice filtered views of frosty Lyon Mountain to the NW and could also see distant mountains to the south. It was a wonderfully clear day and visibility was excellent. Mike and Rev at "Top Dead Center"
I think we missed a turn near the Meadow and we turned east and ended up making another loop before returning to the Meadow. 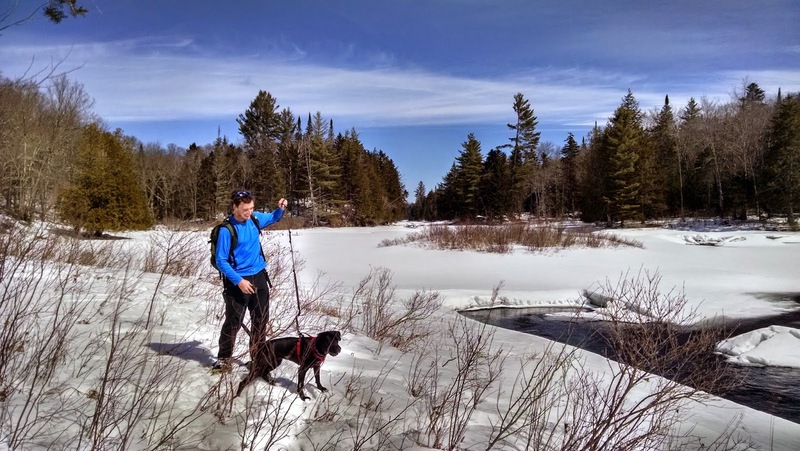 Once back at the Meadow a 2nd time, we found the Saranac Trail that led us back out. We would have have enjoyed staying here much longer, but we wanted to go climb Averill Peak, so after the red trail, we returned to the car to head out for our hike. We will be back here to ski again and explore the other trails. 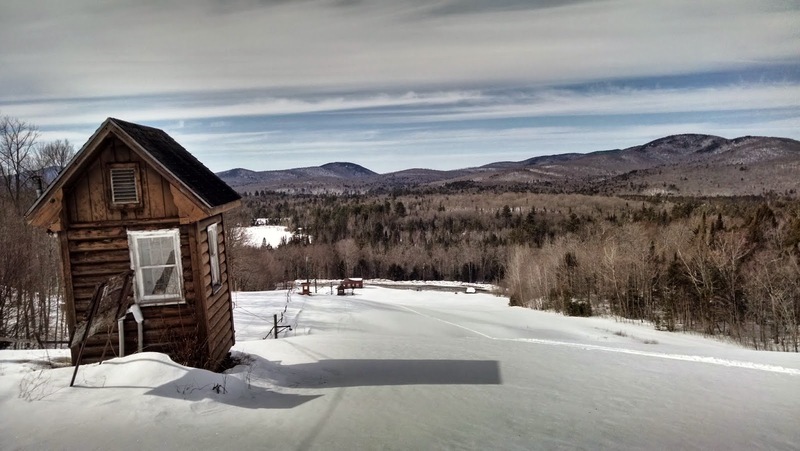 The New Land Trust is an excellent ski and snowshoe area. The elevation (1500-1600') helps ensure good snow cover. Thank you NLT for opening your property to the public for recreation!